Attendees to SAE International’s 2016 World Congress can plan their daily schedules and keep up-to-date on the latest events and happenings with the SAE World Congress Mobile App. New for 2016 is an interactive scavenger hunt that will include photo challenges enabling users to explore the SAE World Congress like never before. Participants have the chance to win exciting prizes each day of the event. 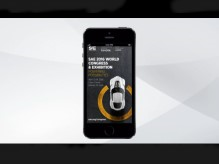 The SAE World Congress Mobile App is available on the Apple Store and Google play. To learn more, visit http://www.sae.org/congress/mobileapp.htm. To download the App, visit http://bit.ly/SAE2016CongressApp. Check out a video on the Mobile App at http://video.sae.org/12092/. For more information on the SAE 2016 World Congress and Exhibition, visit http://www.sae.org/congress/. To request media credentials, email pr(at)sae(dot)org or call 1-724-772-8522.